Like many, I enjoy running. It is something I do to get away from daily stresses, keep fit and clear my mind. It is my zen in life. However, I have long struggled to find a way to record and log my runs. Having tried a number of iOS apps and the Nike+ sensor (back in 2009), I gave up, and simply mapped my runs using runningmap.com and timing my run. Last week, I went to the Nike Town store on Oxford Street in London, my aim being to pick up some long running tights (as there is no sign of summer weather in the UK this year… sigh…). This is when I stumbled on the Nike+ stall, showcasing the Nike+ Fuel Band and Nike+ GPS watch, as shown here: http://store.nike.com/gb/en_gb/?l=shop,pdp,ctr-inline/cid-300/pid-693280/pgid-683903. It was beautiful, sleek and definitely caught my eye! After a little play, I decided to do some online research about it’s functionality, before committing myself. The first thing I actually did was download the Nike+ app on iOS, as I wanted to see how Nike+ had bettered itself from my negative impressions in 2009. In a nutshell, I was very happy to see the enhanced features now available. 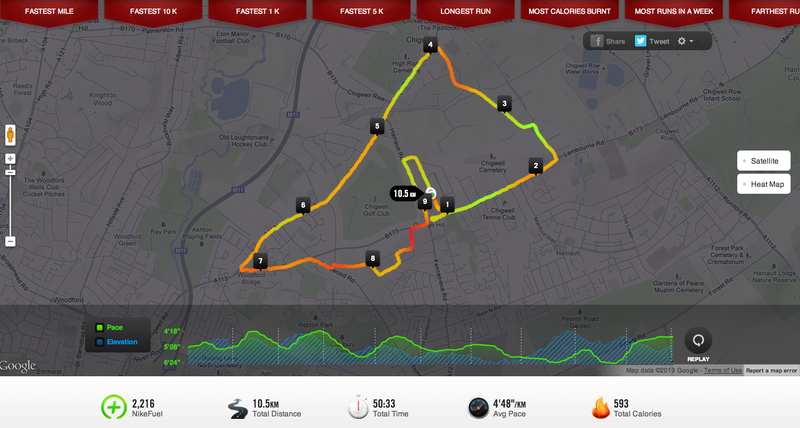 Excited, I went for a 10k run with the Nike+ app on my iPhone. It was a nice run, with Nike+ giving me updates throughout every mile, with my time and overall pace. I was also pleasantly surprised to see my run was (almost!) accurately recorded and only off by <0.16 km in a 10.5 km run! Not bad… Not bad at all! The run data was then synced to my Nike+ account, showing my run on a map, with the incline, speed-break down and my fastest/slowest kilometres. Once my run was uploaded to Nike+, I was given the option to calibrate my run with the ‘actual’ distance covered, which I calculated from runningmap.com. In conclusion, this has definitely helped with my runs and I am really looking forward to testing it out at the Bupa 10k on the 27th of May (2013). Here’s to many more runs! I will be updating my blog with a brief review of the Nike+ Fuel band shortly… Stay tuned. « Hall of Fame and Top 10 on Amazon!